The Stocker Center which is on the campus. 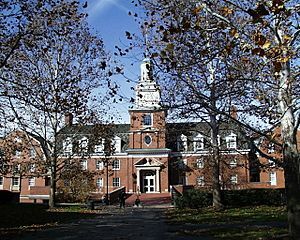 Ohio University is a public university in Athens, Ohio. The university has about 25,908 students. It was founded in 1804. The current president of the university is Roderick J. McDavis. The athletics teams of the university are called the Bobcats. They have 16 varsity teams and they compete in the Mid-American Conference. Ohio University Facts for Kids. Kiddle Encyclopedia.